If you are learning how to make a pancake mix recipe, it consists of four basic ingredients; flour, eggs, milk and leavening. It can save you money by making your own. This mixture can produce many different types of pancakes as well as providing the ingredients for other recipes. There are few foods more delicious than fresh hot pancakes that have been spread with good butter and smothered with warm maple syrup or fresh fruit. 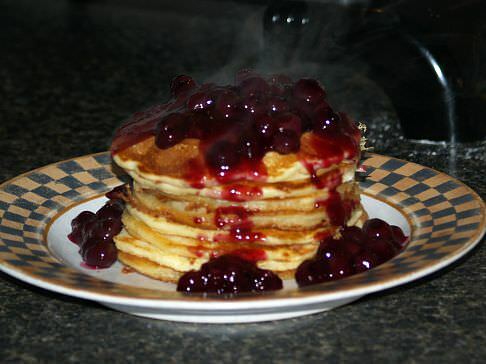 A basic pancake recipe is often served for lunch and dinner as well as breakfast; they can even be good for dessert. If you learn how to make this pancake mix recipe and keeping it ready you can make a basic pancake recipe which will become instant gratification no matter when you want it. 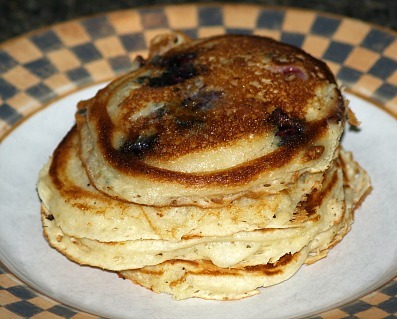 A basic pancake recipe can produce thick ones or thinner by just adding a little more liquid. They can also be made in any size or shape; whatever you desire. By learning how to make this pancake mix recipe and keeping it on your shelf, a basic pancake can be transformed instantly just by a variety of toppings. I often use fresh or frozen berries (blueberries, blackberries, raspberries, strawberries) for a topping. Simply heat the berries; fresh will need a little water; frozen usually are frozen in water). Sometimes I add a little sugar and sometimes I do not; it depends on your preference. If you want the fruit thickened, mix a tablespoon of cornstarch with a little water and stir in the fruit; cook and stir until thickened. These fruits make great pancake topping recipes! Cherry Topping: Cut sweet cherries in halves removing pit; simmer in small amount of water 2 to 3 minutes. Drain the cherries and spoon over basic pancake recipe. Plum Topping: Cut 1 ½ pounds of plums in quarters removing pits. Simmer in small amount of water a few minutes. Drain and spoon over top. Apple topping: Peel, core and slice 3 large apples. Sauté in small amount of butter. Spoon over pancakes and sprinkle with cinnamon and sugar. Many of my friends in their cheap retirement living love this one. Blueberry topping: 2 Cups fresh blueberries, 4 Tablespoons sugar, 1/4 Cup water, 2 Tablespoons cornstarch, 3 Tablespoons water. Place blueberries, sugar and 1/4 cup water in a saucepan; bring to a boil. Mix cornstarch with 3 tablespoons water until smooth; blend into blueberry mixture. Stir and cook until thickened 3 to 5 minutes. Serve warm over pancakes. Bacon and Onion Topping: When mixing pancake mix recipe, leave out the sugar. Cook ½ pound bacon until crisp; drain on paper towels. Remove most bacon fat from skillet and sauté onion in skillet. Combine onion with crumbled bacon and spoon over top. By adding many different ingredients you can make a variety of totally different pancakes. Blend into the basic pancake recipe almost any type of well drained fruit and you can instantly change the flavor of the product. One of my favorites is to add drained whole kernel corn to the batter. These pancakes are simply delicious with pure maple syrup. This pancake mix recipe also makes a great onion ring batter recipe; for beer batter onion rings recipe. Who doesn’t love those delicious beer batter onion rings! They are one reason for going out to eat; now make them in your own kitchen at a fraction of the cost. These are cheap recipes when you make your own mix. The mix goes together in a snap; once you try it, you won’t be buying from the store again. Combine all ingredients in a large bowl. Stir to blend and store in a zip lock plastic bag. Combine pancake mix and the sugar in a medium bowlBeat together the buttermilk, egg and oil; add to the dry ingredients, beating until all lumps are gone. Pour ¼ cup of batter onto a hot lightly oil griddle; Cook for a couple of minutes and then turn over. For pecan pancakes add ½ cup chopped pecans. This pancake mix makes a great onion ring batter recipe. Cut onions into ½ inch slices and separate rings. Combine 1 ¼ cups of the mix and the sugar. Stir together the buttermilk and the beer. Whisk into the pancake and sugar mixture until smooth. Set aside. Place the onion rings and remaining ½ cup of mix in a large zip lock bag. Seal and shake to coat. Pour oil 2 inches deep in a Dutch oven; heat to 370F degrees. Dip onion rings 1 at a time into the batter, coating well. Fry in batches until golden brown turning occasionally.